Proving that many hands do indeed make light–and fun–work, more than 150 Belmont faculty and staff teamed together Thursday to volunteer at Second Harvest Food Bank of Middle Tennessee, a nonprofit founded in 1978 that works to feed hungry people and solve hunger issues in Middle and West Tennessee. Last year alone, Second Harvest’s fleet of 19 trucks covered 533,374 miles rescuing and delivering food to a network of more than 450 partner agencies and directly to hungry children, families and seniors throughout a 46-county service area. Belmont’s annual faculty/staff service project, which the University dubbed “It’s Bruin Time in the Community,” began last year with employees spending a morning painting at Hunters Lane High School. This year, with Vision 2020 ideals in mind, Belmont employees registered to serve during one of two three-hour shifts as part of the University’s ongoing commitment to be “‘Nashville’s University’, aligning Belmont’s vision and resources with the ever-changing needs of the people in our community.” Divided into two teams upon arrival at Second Harvest’s Martin Distribution Center, one group was tasked with sorting enormous cartons of sweet potatoes into 5 lb bags, which would be weighed for accuracy and packed for shipping to food pantries and churches. 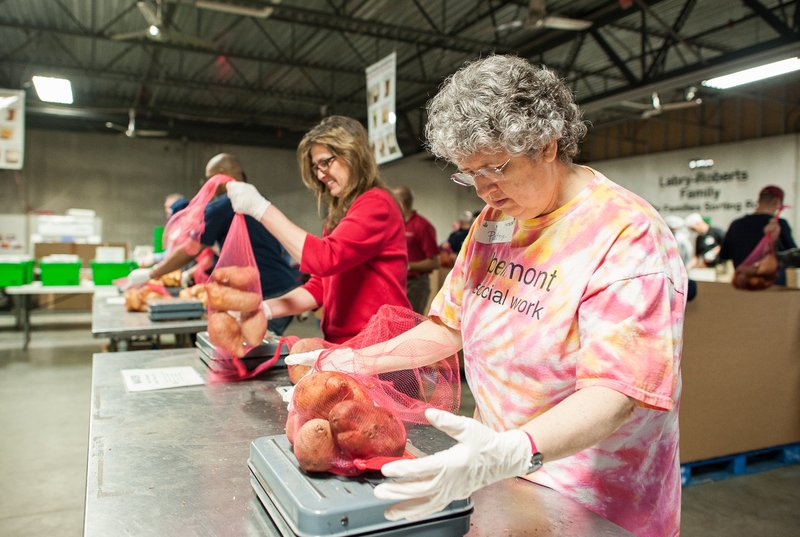 Between the morning and afternoon shifts, Belmont employees sorted more than 15,000 lbs. of frozen foods and 30,000 lbs. of sweet potatoes for packing and delivery. Click here to see additional photos of the event.